Emergency! The incubator broke down and eggs are at risk of dying! It is always best to keep a cheap incubator as a back-up. If none is available, you might try to use some heat packs like the sportsmen use. Other options are heating pads or reptile rocks. Lactated Ringers solution--for compacted or sluggish crop. You can use the solution instead of water to mix the formula. Contains electrolytes. Pedialyte also works well. It is readily available in the baby food section of the grocery store. Electrolyte replacement therapy in case baby isn't doing well. 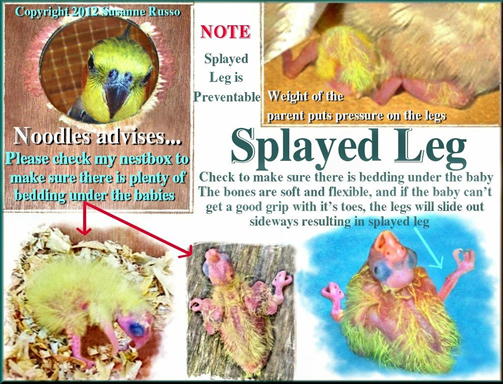 Splay leg is a leg or pelvic socket deformity in chicks. Inappropriate Nesting Surface, which means the nest box floor is too slippery (inappropriate nesting material), or there isn't enough bedding - so a chick cannot get good footing to hold its weight. Therefore, one or both legs will slip out from underneath thus force the leg bone from the hip socket or distort the "knee" out of alignment. If these conditions are not remedied early, the damage will be permanent. Obviously, nutrition needs to be looked at to see if modifications are necessary. Learn more about bird nutrition. I myself found a good way to fix a splay-legged baby is to put it in a narrow dish, cozily wrapped up in several layers of tissue. This way the baby is completely comfortable, and after a few days to a week, you will see that the baby's legs are normal. The important thing is the size of the cup.The cup should be too narrow for the baby to be able to turn around. It should be just a slight bit wider than the width of the body of the baby. If the baby keeps wanting to climb out, then choose a higher cup. This method works well for the youngest chicks. Another excellent option successfully implemented by breeders is to put a band on each leg and tie a piece of cotton string between them. This way the chick still has a lot of mobility, and it doesn't have to be changed out often. This condition can either be caused by low humidity in the brooder or nest box, or by a thread that tied around a toe. Low humidity may cause a ring of a layer of the skin to contract - as it does, it cuts off the circulation of blood to the end of the toe. If the contriction is not removed, it will eventually cause the constricted part of the toe to dry up and fall off. If the constricting skin is visible, it may be softened with some butter or coconut oil, and carefully removed. Summary: In unfeathered babies, a Candida-infected crop will show signs of cheese-like lesions, and a grayish-white layer covers the crop lining. The often ulcerated and inflamed wall will be thickened and opaque, making the crop puffy and abnormal looking. If you suspect your baby to suffer from this, please go to this website. Crop punctures are often caused by either carelessness or inexperience in tube feeding. The food is pumped into the crop through a tube that has been put down the esophagus and into the crop. If the tube is pushed too far, or if the baby jumps, the tube may be pushed through through the crop membrane and the outer skin to cause a puncture. If this happens, food put into the crop will leak out of the puncture. The only way to correct this problem is to suture the inner and outer layers of the crop and skin; and administer antibiotics to prevent infection. The same injury to the crop can be caused by crop burn (feeding formula that is fed too hot burns a hole through the skin). Tell-tale signs will be inflammation and swelling around the puncture wound. 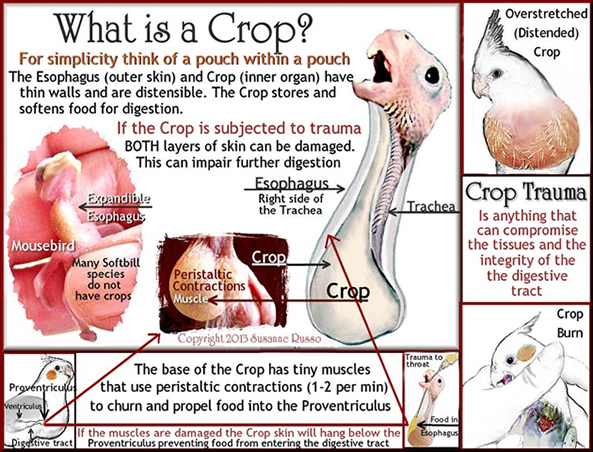 The absence of food in the crop after a baby has just been fed would indicate a severe injury. This will require surgical intervention (suturing, etc. ), or the baby may not survive. Saving eggs that were opened prematurely.